Table of Contents Next: Royal, Forrest B.
Mann (1999). Fair use may apply. The Royal Netherlands East Indies Army (Koninklijk Nederlands Indisch Leger or KNIL) was organized in 1830 and by 1941 had 35,000 regular troops, of whom 28,000 were native Indonesians. These were well-trained but not well-equipped. They were supplemented by a much large reserve (Reservekorps and Landstorm) and militia (Stadswacht) that were relatively poorly trained. The latter were all-Dutch, but in June 1941 a native militia began to be raised. I. Division (Schilling; at Lembang) 1 and 2 Regiments. 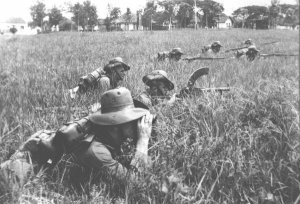 Though the strongest of the Dutch divisions on Java, it was still understrength. Detachmant Madoera (at Djombang) About three battalions of natives prepared to fight as guerrillas.